XJL-17 series metallurgical microscopes are used for identification and analysis of the structures in different metals and alloys. They are the important instruments for researching metallography in metal physics. The instruments can select special photography device to take euploid pictures of atlas metallograph. 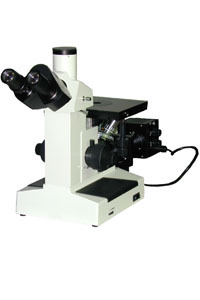 The instruments are suitable for scientific research、colleges and factory . * Trinocular is compensation, can switch to observe normally or to observe the Polarize, can send 100% of light to top photography port.